Former Newcastle legend Alan Shearer has lashed out at Chelsea boss Maurizio Sarri following the 2-0 defeat to Arsenal on Saturday evening. The Blues were repelled by London rivals Arsenal with Lacazette and Konscienly netting the goals. The defeat ensured that Manchester United closed in on Chelsea to three points with the fourth position looking likely to be a three way battle. 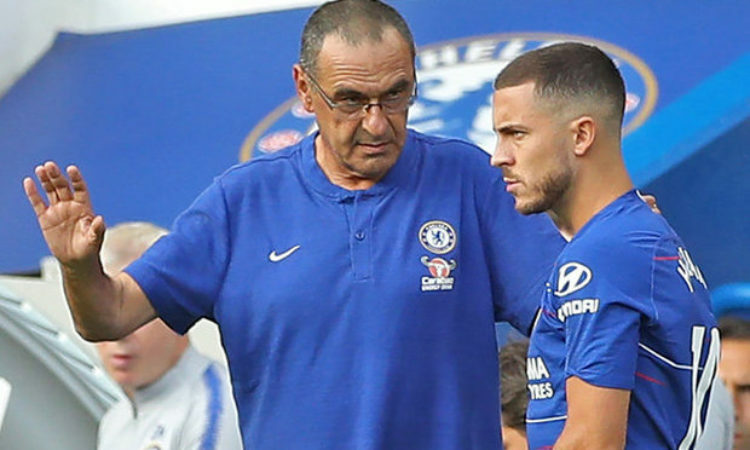 Sarri in his post-match talk had launched an attack on his players, with the Italian tactician questioning their attitude and motivation but the all-time Premier League top scorer insists that the Italian tactician has no one but himself to blame. Speaking at the Match of the Day program, the Englishman insisted that Chelsea’s main problem was Sarri’s tactical approach towards game. He said: “They’re not scoring enough goals. They’re not getting enough people in the box. “They’ve got Hazard playing in a centre-forward position that I don’t think he’s comfortable in. “Hazard as a centre-forward has got to hold it up, got to bring people into the game and he’s not able to do that – it’s not what he’s good at. Shearer also revealed that Sarri’s public criticism of players was a mistake, stressing that it could backfire with the team hosting another rivals Spurs in the reverse fixture of the Carabao Cup during the mid-week. “We’ve seen it in the past when managers have criticised players openly on television. It doesn’t work,” Shearer said.